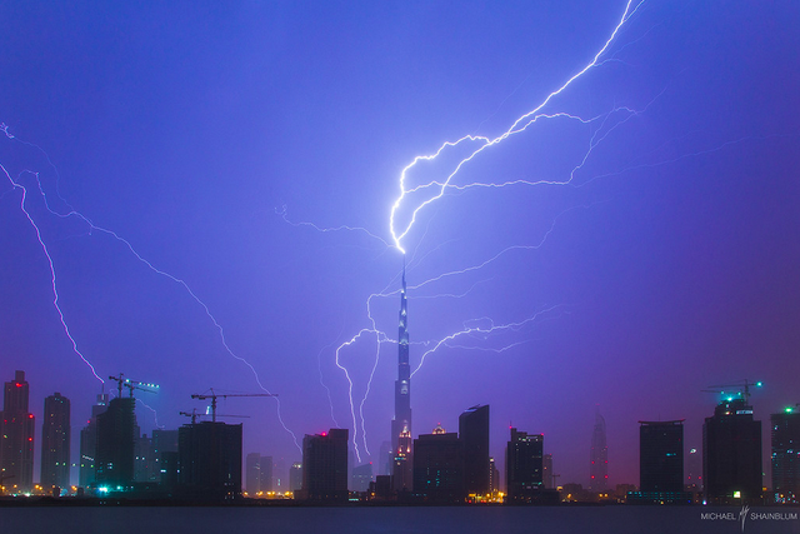 Presenting the money shot: during a massive storm in Dubai yesterday, photographer Michael Shainblum captured lightning zapping Burj Khalifa, aka the tallest building in the world. [Most] of the fainter trails are not actually lightning bolts, but upward streamers. Lightning moves downward from a cloud through a series of "step leaders", short strokes of ionized gas. When a leader nears the surface, the ground reacts by sending up a short streamer. If the two connect, BANG! Leaders and streamers are much weaker than the actual lightning stroke, so I suspect that's what we're seeing, especially since so many of the zig-zagged streamers are connected to the ground but not the cloud. Photo courtesy Michael Shainblum. Check out more from him on 500px and Facebook.